Crime and corruption, common scourges of modern societies, top the list of problems cited by publics in emerging and developing nations. A median of 83% of people across 34 emerging and developing economies say crime is a very big problem in their country, and 76% say the same about corrupt political leaders. Many also worry about issues such as health care, poor quality schools, water and air pollution, and food safety. Generally, electricity shortages and traffic are seen as less pressing issues. People in Latin America, Africa, Asia and the Middle East all see crime and corruption as the greatest problems in their countries, according to the Pew Research Center survey. Moreover, crime and corruption as well as poor quality schools are considered growing problems in these emerging and developing countries. Taking the median across the 20 countries surveyed in 2007/2008 and 2014, the number of people citing these three issues as a very big problem has jumped from 64% to 74% for crime, 63% to 73% for corruption and 38% to 51% for poor quality schools. In nearly all these countries, the list of key challenges exist alongside economic problems including jobs, rising prices and public debt (see Global Public Downbeat about Economy, published September 9, 2014). When asked to rate key institutions in their countries, people generally assign high marks to the military, with a median of 79% saying it has a good influence on the way things are going in their country. But most major national organizations and groups, such as the media, religious leaders, banks, corporations, the national government and civil servants also get positive marks. Emerging and developing publics are less enamored with their court systems – the only institution polled which receives support from less than half of respondents. Overall, there have been only slight changes in views of these national groups and institutions since 2007, but within a few countries there have been dramatic swings in opinion. For instance, in Turkey, where President Erdogan has made weakening the influence of the military on civilian government a top priority, support for the armed forces has sharply declined in the last seven years. In the Middle East, a median of just 40% say that religious leaders are having a good influence on their country, and there has been a sharp loss of confidence in religious leaders among Jordanians, Turks, Egyptians and Palestinians since 2007, and among Tunisians in the last two years. But in Argentina, there is a double-digit gain in ratings for religious leaders (+26) since 2007, likely related to the elevation to the papacy of their own Cardinal Jorge Mario Bergoglio, who became Pope Francis just last year. These are among the findings of a recent survey by the Pew Research Center, conducted in 34 countries among 38,620 respondents from March 17 to June 5, 2014. 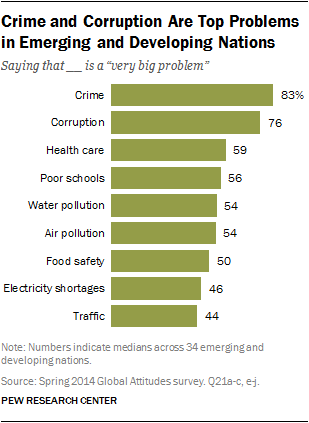 Crime is seen as a very big problem by a median of 83% across the 34 emerging and developing economies surveyed. In 19 of these nations, crime is either tied for or holds the top spot among the nine problems tested. Law-breaking is more of an issue in Latin America (a median of 86% say it is a very big problem) and Africa (84%) than it is in Asia (72%) and the Middle East (67%). Crime is a lesser issue in the three Eastern Europe countries surveyed – less than half in Russia (47%), Ukraine (37%) and Poland (31%) see it as a top problem. A median of 76% across 34 countries say corrupt political leaders are a very big problem in their country. This comprises the top spot in 10 of the countries surveyed, including in China, where 54% say corrupt officials are a big concern. Africans are far and away the most concerned about corruption (a median of 85%), but this issue also resonates broadly in other regions, including Eastern Europe. In Russia and Ukraine, 65% and 73% respectively cite corrupt political leaders as a top problem. A median of 59% across emerging and developing markets say health care is a very big concern. Generally, Latin Americans, Africans and Middle Easterners are more worried about health care than Asian publics. A median of 76% across 34 countries say corrupt political leaders are a very big problem in their country. While no emerging country cites poor quality schools as its greatest problem, a median of 56% are very worried about this issue. Concern is greatest in Africa and Latin America. And a global median of 54% rate both water and air pollution as a very big problem. Pollution is one of the top problems cited in Latin America, and six-in-ten Middle Easterners rank water pollution as a very big concern. A median of 50% across the emerging and developing nations surveyed say food safety is a pressing issue. Concern for the safety of food is greater in the Middle East and Latin America compared to Africa and Asia. Electricity shortages and traffic are at the bottom of the list of problems tested. However, electricity shortfalls are a greater problem for Africans compared with other regions. African nations tend to lag behind other regions in power generation. And in Pakistan, where electricity shortages are a common occurrence, 90% say it is a very big problem. There has been an overall increase in concern about the problems of crime, corrupt officials and poor quality schools in the emerging and developing nations surveyed in 2007 and 2014. For instance, in 2007, a median of 64% said crime was a very big problem across those 20 countries, but in 2014, 74% do. An almost identical change has occurred for the problem of corruption. And in 2007, a median of only 38% across these countries named poor quality schools as a big concern. Now, about half say this. Many African countries are increasingly worried about crime, as are publics in Mexico and Argentina. All have seen double digit increases in concern about crime since 2007. But in Eastern Europe, concern about crime has fallen dramatically since 2007, and especially since 2002. In 2002, 80% named it as a big issue in Poland, but only 31% say this in 2014, an astounding drop of 49 percentage points. Similar drops have occurred in Ukraine (-29) and Russia (-28) in the last 12 years. And in South Africa, which has seen its high homicide rate fall by a third from 2002 to 2012, worries about crime have dropped from a nearly unanimous 96% in 2002 to a still-high 74% today. Worries about corruption are also increasing in many countries, particularly in Africa. In 2007, 52% of Ghanaians said corrupt political leaders were a top issue, but that number stands at 85% today. In Malaysia, which formed an independent anti-corruption commission in 2008, 63% name corrupt political leaders as a very big problem, up from 28% in 2007. In China, where many say bribery is important for getting ahead in life, there has been a 15 percentage point increase in worries about corrupt officials since the question was first asked in 2008. And in Turkey, another country recently racked by corruption scandals, concern has jumped 25 percentage points since 2007. On the contrary, worries about corruption in Poland have plummeted since 2002, when 70% named it as a very big problem. Only 46% say the same today. In Africa, increasing numbers cite poor quality schools as a top problem in Ghana (+33 percentage points), Tanzania (+32), Uganda (+30) and Kenya (+19) since 2007. There also has been a rise in worries in Malaysia, Chile (which recently saw large-scale protests by students pushing for education reform), the Palestinian territories, Mexico and China. (For more on Mexican views of education, see Mexican President Peña Nieto’s Ratings Slip with Economic Reform, published August 26, 2014). Across the emerging and developing countries surveyed, people rate the military as the most positive national institution.1 Overall, a median of 79% say the military is a good influence on the way things are going in their country, while only 18% say it is a bad influence. Asians are the most supportive of their military, but publics in Africa the Middle East and Latin America all say the armed forces are a good influence on their country. In 14 nations, the military receives the highest ratings among all the institutions and groups tested. Nine-in-ten or more in Tunisia, Senegal, Lebanon, Vietnam and Tanzania rank it as a good influence. However, people in a few Latin American countries, where military coups were once a common occurrence, are more skeptical of the armed forces. This includes positive ratings of only 26% in Argentina (which had six coup d’états in the 20th century) and 43% support in Venezuela (which experienced two failed coup attempts in 2002 and 1992, and three successful ones in the mid-20th century). 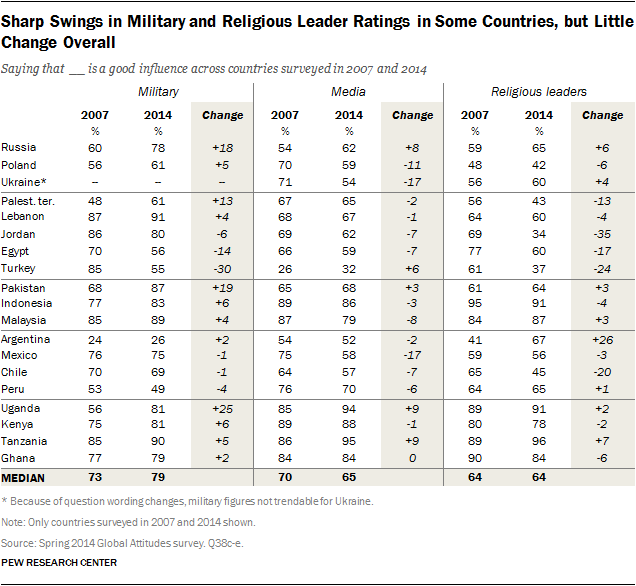 Militaries have seen their reputations remain relatively stable in countries that were surveyed in both 2007 and 2014. In 2007, a median of 73% had faith in national armed forces and 79% do now. There are big rating boosts for the military in Uganda, Pakistan and Russia. For Russians, the increase in offensive operations in its region under President Putin might explain why support for the military jumped from 53% in 2002 to 78% today. Meanwhile, support for the Turkish military has plummeted since 2007, from 85% positive ratings then to just bare majority support now (55%). Media, such as television, radio, newspapers and magazines, also gets positive ratings from respondents. Seven-in-ten across the countries surveyed say the media is a good influence, while only about a quarter disagree. The media is especially appreciated in Africa, where a median of 88% say it is having a positive influence. This includes the highest rankings among all institutions tested in Uganda, Nigeria, Kenya and Ghana. Middle Easterners are slightly less enamored of the media. And in Turkey, mass media is seen positively by only 32% of the public (For more on Turkish views of the media, see Turks Divided on Erdogan and the Country’s Direction published July 30, 2014). Views of the media across countries surveyed have been relatively stable. In 2007, a median of 70% saw television, radio and newspapers as a good influence, and a median of 65% across 19 countries say the same in 2014. However, significant drops have occurred in Ukraine, Mexico and Poland since 2007. While religious leaders are respected globally (a median of 69% say they are a good influence vs. 20% bad influence), there are regional differences. African publics are very positive towards leaders of religion, with a median of 86% saying they are a positive influence. This includes nine-in-ten or more in Tanzania, Senegal and Uganda. Asians and Latin Americans are also favorably inclined towards spiritual leaders, although opinions dip a bit in India (54% good influence) and Chile (45%). However, in the Middle East, leaders of faith receive some of their lowest ratings in the survey. Less than half in Tunisia (33%), Jordan (34%), Turkey (37%) and the Palestinian territories (43%) see spiritual leaders as a good influence. These figures represent a sharp decline in views of religious leaders since 2007 in the Middle East. In Lebanon, where 60% say religious leaders are a good influence, there is a religious divide. Roughly eight-in-ten Shia Muslims (79%) say spiritual leaders’ influence is a good thing for Lebanon, while 58% of Lebanese Christians and only 45% of Lebanese Sunni Muslims agree. Argentina is the only country with a double-digit gain in ratings for religious leaders (up 26 percentage points) since 2007, and religious leaders are clearly the most respected group there (67% good influence). In the Middle East, leaders of faith receive some of their lowest ratings in the survey. Banks and other major financial institutions, as well as corporations, receive positive marks in most countries. Asian and African publics are most keen on these institutions. Big business is less smiled upon in Eastern Europe, where less than four-in-ten say corporations are a good influence in Poland (37%), Russia (35%) and Ukraine (27%). Pakistanis are also soured on financial institutions – just 26% say corporations are a good influence in their country. Ratings for national governments vary greatly by country and region. Overall, a median of 59% across the countries surveyed have a positive impression of their own government, with 38% saying their influence is bad. National governments are more appreciated in Asia and Africa, but fewer in the Middle East and Latin America say the same. The lowest ratings for governments comes from publics in Poland, Argentina and Egypt. Across all the 18 countries surveyed in both 2007 and 2014, median ratings for the national government have changed little in the last seven years. Civil servants, which go hand in hand with national leadership, are generally seen as a positive (median of 54% see them as a good influence vs. 39% bad influence). But they get lower marks in Latin America. The lowest ratings for civil servants come from people in Ukraine, Mexico, Venezuela, Poland and Argentina. The national institution with the lowest ratings among those tested are court systems. A median of only 47% across the emerging and developing countries surveyed say the courts in their country are a positive influence, while a nearly equal 44% say they are a negative influence. The judiciary is tied for or is on the bottom of the organizational rankings in 16 countries. Still, around two-thirds of publics in African and Asian countries say the judiciary is a positive influence. The courts are most criticized in Latin America, the Middle East and Eastern Europe. Less than three-in-ten in Ukraine (14%), Argentina (19%), Chile (24%) and Brazil (25%) give the judiciary a positive rating. Overall, there are few demographic differences by age and gender across countries on the influence of national groups and organizations. But one exception is that in several countries, young people (18 to 29 year olds) are more positive towards corporations and banks than are those who are 50 years and older. For example, in Thailand, a country that is heavily dependent on exports for economic growth, the younger generation is 30 percentage points more likely to say corporations are having a good influence on their country, compared to those Thai age 50 or older. And in other emerging markets, including Argentina, Ukraine, Russia and Vietnam, the same pattern holds true.